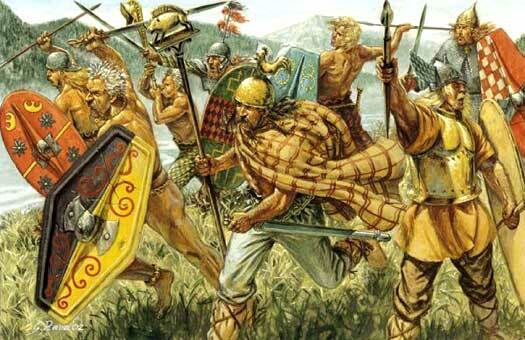 The Cugerni were not amongst the four tribes described by Julius Caesar as Germanic but with at least one leader who bore a Celtic name. Those tribes were the Caerosi, Condrusi, Eburones, and Paemani, but the Cugerni also appear to have been more Germanic than Celtic. They were a minor tribe which was located between the Rhine and the Maas, amongst the tribes of the Belgae, in what is now northern France and the low lands of Belgium. To their west were the Eburones, to the north were the Paemani and the Menapii, across the Rhine to the east were the Germanic Bructeri, Ubii, and Sicambri, and to the south were the Atuatuci and Tungri. The tribe's name is amongst the more obscure Celtic or Germanic names (and can also be rendered as Cuberni or Guberni). The core element, 'cug', does not seem to exist as a verb. This leaves any examination with a very large 'if', this being that if 'cug' is is a verb, then the '-er' suffix forms a noun and '-en' a plural. Failing this, and due to horrifying spelling irregularities with ancient writers, 'cu' is a hair-raising misspelling of 'ke-', an alternate form of 'ge-' (together), which progresses as 'ge-ger-en', 'together-spears'. This produces a meaning of 'the spearmen together', but the evidence to back this up is very thin. For the main part, the tribe is thought to have been a splinter of the Sicambri, but with other elements added. Like the other apparently mixed tribes such as the Paemani, they probably formed or arrived around the start of the first century BC, quite possibly as overspill from the mass migration of the Teutones and Cimbri. Their territory included Castra Vatera and Xanten (a town in the North Rhine-Westphalia state of modern Germany), both on the Rhine. As recorded by Julius Caesar in his work, Commentarii de Bello Gallico, the Germanic Tencteri and Usipetes tribes cross the Rhine from Germania and attack first the Belgic Menapii and then the Condrusi and Eburones. The tribes of the Caerosi, Condrusi, Eburones, and Paemani are Belgic peoples who are sometimes thought by scholars to be Germanic, although much of the evidence seems to suggest that they are either Celts, or are ruled by a Celtic nobility. Following the failure of their revolt, Ambiorix of the Eburones flees before the Romans and Cativolcus commits suicide by poisoning. Despite this apparent capitulation, the country of the Eburones proves difficult for the Romans, being woody and swampy in parts. Caesar invites the neighbouring people to come and plunder the Eburones. After stubborn resistance from the tribe, Caesar burns every village and building that he can find in their territory, drives off all the cattle, and confiscates all of the tribe's grain. The tribe is destroyed by this action and no further mention is made of them in history. Their land is occupied by the Germanic Tungri, but it is likely that survivors from the tribe find a home with the Cugerni, among others. Under the authority of self-proclaimed emperor, the Lingones noble, Julius Sabinus, Gaius Julius Civilis leads a Batavian insurrection against a Rome which is distracted by the events of the 'Year of the Four Emperors'. He is supported by the Bructeri, Canninefates, Chauci, Cugerni, and Tencteri, while the Sinuci are also mentioned as a people who live in the region (although their involvement in the revolt is uncertain). The tribes send reinforcements and Civilis is initially successful. Castra Vetera is captured and two Roman legions are lost, while two others fall into the hands of the rebels. In AD 70 the Chatti, Mattiaci, and Usipetes join in, besieging the legionary fortress at Mogontiacum (modern Mainz). The Cugerni are subsumed within the Roman empire. Their region is somewhat depopulated in later Roman times in the face of increasing raids by Germanic tribes that are pushing westwards. Eventually, any Cugerni who remain in their homeland are overwhelmed by the Frankish confederation.